Cocos Island is an amazing, lush green and uninhabited island located 600 km (375 miles) off Costa Rica's Pacific coast. Its beautiful turquoise water features a wide diversity of marine life: schooling hammerheads, white-tip sharks, mantas, tunas and whale sharks all call Cocos home. The landscape of the islanc is mountainous and irregular. It has a rectangular shape and includes four bays, a number of short rivers, an infinite number of submarine caves and over 200 waterfalls, of which some of them fall into the sea! The island receives about 7,000 millimeters of rain falls every year. Its highest point is the Cerro Iglesias at 635 meters (2080 feet) over the sea level. Cocos Island is an important location for scientific investigations: 235 species of plants (70 endemic) 362 of insects, 84 of birds, 200 kinds of fish and 18 kinds of corals have been found so far. Cocos Island is admired by scuba divers all over the world for its natural beauty and its innumerable hammerhead shark, dolphins, white tip reef sharks, mantas, sailfish, whale sharks, coral reefs and more. The island was designated a National Park of Costa Rica in 1978 and was declared a world heritage site by UNESCO in 1997. And it is continuously nominated as one of the new 7 natural wonders in the world. There are no accommodations available on the island and camping is not permitted. All visitors must arrive by boat. 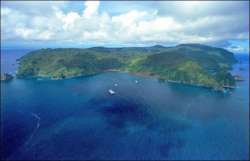 There are several dive boats available; most depart from Puntarenas and the journey to the island takes about 36 hours. Visitors are allowed to enter Wafer Bay and Chatham Bay, where you will find a few facilities including dining huts, rest areas and sanitary services and showers.